Are you looking cheap wedding invitations? Well of course you are, or you wouldn't be read this! There are so many ways to save, and not all of them are for everyone. 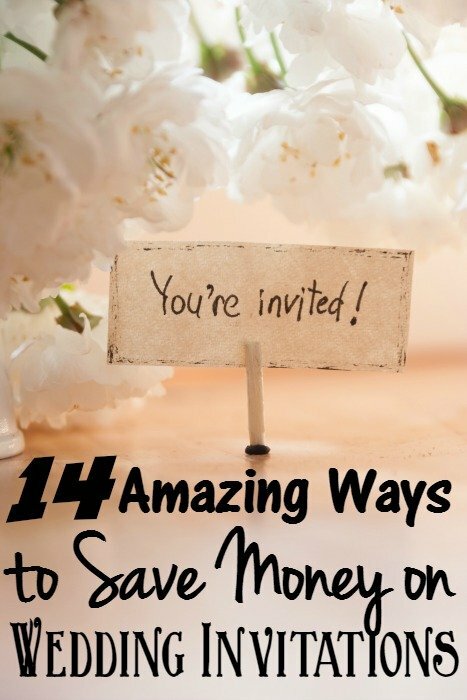 here are 14 ways to save money take what works for you and leave what doesn't. Skip the Upgrades – You don't need the envelope liner and fancy ink or even the intricate details. Pick the Right Paper – Skip the fancy papers and used partially recycled paper and save money! There are tons of color choices too. Order Extras – Spend a bit up front to save money on the last minute ones that would cost more to order later. Skip the Map – Enclosing a map and even other directions can cost you money. Get a Free Wedding Website and put all your maps and directions a website and include the URL on the invitation. Skip the invitations – Go modern and use an Evite service and only have a few invitations printed for those who don't do technology like grandma and grandpa. One Instead of Two – Don't print your reception info on a separate card, print it all on one to save money. Skip the Self Addressed Stamped Envelope – Have your guests RSVP via your website or by phone. Proof Read x5 – Proof read your invitations, have your maid of honor proof read and a few family members and friends. If there is a mistake, you either have to live with it or have it all printed again which will double your invitation costs. Print Your Self – You can buy wedding invitation kits and print them yourself at home. You can get 100 invitations for under $20 for basic ones. You can get more fancy ones in sets of 25 as well. Hand Address – Skip the fancy writing for addressing your cards. Enlist the help of family and friends and hand address them yourself! Avoid Odds Sizes – Avoid odd size envelopes, like squares, they cost more to mail! Use Coupons – Use Discount Wedding Invitation Sites and use coupon codes to get sales and deals on your order. Plus designing them yourself will save you money and give you a customized look. Skip Traditional – Go for something like picture invitations. You can create a great look for free on PicMonkey or Canva and then use a site like York Photo to print them out for just 4¢ a print! You can see some of my favorite picture wedding invitations on Pinterest HERE and HERE. DIY It – There on TONS of DIY ideas on Pinterest! Also, follow my Saving Money on Weddings Pinterest Board for more great ideas! What Cheap Wedding Invitations ideas do you have? Please let us know!